A few years ago I really wanted to open up to the spirit realm and learn to connect with my spirit guides, but for months on end, fear stood in my way. I was scared of seeing/hearing ghosts, disembodied voices, evil entities and even my own spirit guides. I felt that hardly anyone could help me overcome this issue and most of those who did just said I had to ‘face the fear’, which I felt wasn’t much help because I was paralyzed by it! Later on I had some help and reassurance from other psychics and had many breakthroughs of my own in my understanding of the spirit world, which helped me to deconstruct my fear and see it for what it was. I will share some of these breakthroughs in this post. Clairvoyance means ‘clear-seeing’. Almost everyone knows what clairvoyance is – it’s the ability to see Spirit through your third eye. Clairvoyants can see energy fields, spirits, symbols and get visual premonitions. Developing clairvoyance isn’t difficult – in this article, I give you some pointers to do this. 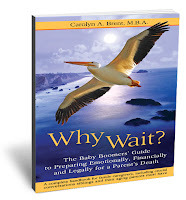 Today, author Carolyn A. Brent launches her new book, Why Wait? The Baby Boomers' Guide to Preparing Emotionally, Financially and Legally for a Parent’s Death, on Amazon on Tuesday November 15, 2011. Carolyn A. Brent, M.B.A. is a former clinical educational manager in the pharmaceutical industry. She is an avid activist and advocate working with the U.S. Congress for the purpose of creating change to protect seniors and veterans from financial and medical abuse. She has appeared on many local and national TV and radio shows, and is a sought-after keynote speaker. Today, I'd like to share with you a recent podcast interview I had with Carolyn. I hope you enjoyed this interview with Carolyn and that you’ll check out her book, Why Wait? The Baby Boomers' Guide to Preparing Emotionally, Financially and Legally for a Parent’s Death at http://www.babyboomersguide.org/book-launch/pre-launch.html. To read about the free gifts, go to: http://www.babyboomersguide.org/book-launch/pre-launch.html. An effective estate plan is more than a decision on how to distribute your assets after death and should be developed at the law offices of a qualified estate planning attorney. A will is an important starting point in the process, but may not always be enough depending on your specific situation. There are a variety of estate planning tools that can be utilized to give you and your family security and peace of mind. A will is a written document that outlines how a person wants their assets and property distributed upon their death. If applicable it will indicate who will become the guardian of minor children or disabled dependents. A will also sets out who will administer the estate. Listen to the interview with Carolyn Brent too learn why it's so important to have end-of-life discussions before you are placed in a position to make a decision while wrought with emotions. Using quality legal representation to assist you in preparing your will can help ensure your wishes are followed. Dying without a will or leaving an ill-prepared will can lead to confusion, contests by family members and increased probate costs. A trust is used to manage assets or property. There are different types of trusts available depending on the situation. For instance, a living trust is used to transfer assets to a trust to be administrated for the benefit of the person until death. A testamentary trust is established in a will and usually prepares for the financial care of minor children or disabled dependents. A successful and enforceable trust should be prepared by an attorney to ensure it meets all legal requirements. Other important estate planning tools include living wills and powers of attorney. A power of attorney is used to assign personal powers to an agent to act on your behalf in a legal capacity. Different types of powers of attorney include limited, general, durable and financial. For instance, a durable power of attorney allows your agent to act in your capacity during your incapacitation. Utilizing a power of attorney in this regard helps avoid the state becoming involved in your affairs. Quality legal representation can help you understand what type of documents applies to your unique situation and ensure they are executed correctly. A living will, also referred to as an advanced health care directive, is used to specify your wishes concerning end of life decisions. Specifically, it is used to communicate to family members and medical professionals what life-saving measures, if any, should be taken. Using an attorney to help draft your living will can help guarantee there are no misunderstandings regarding your last requests. Developing an estate plan has become a necessary part of life. It is important to interview and hire a qualified attorney from a law firm capable of handling your estate planning needs. At the law offices of Stone, Duncan, & Associates, PC we provide quality legal services and a unique legal experience to individuals, businesses, and professionals throughout Pennsylvania. If you're looking for a Criminal Lawyer in the counties of Adams, Berks, Cumberland, Dauphin, Franklin, Fulton, Lancaster, Lebanon, Perry, Schuylkill, or York, give us a call. 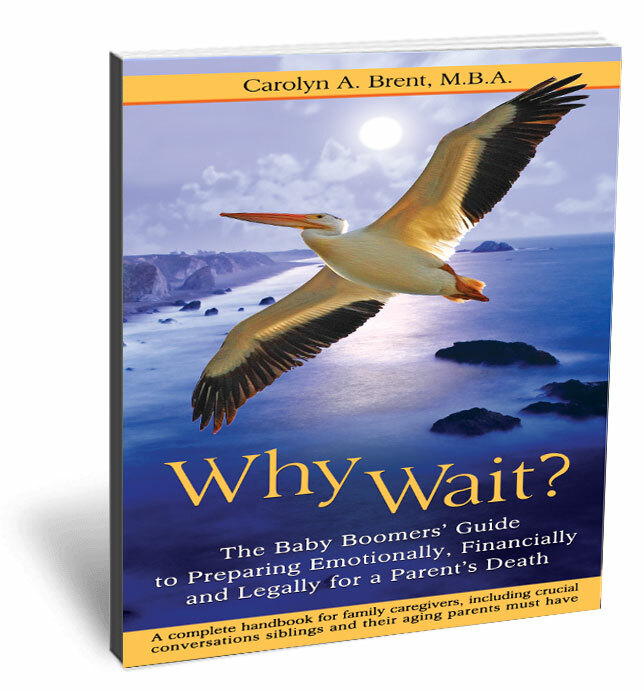 I believe many of us baby boomers will find the topic of Carolyn A. Brent's new book, Why Wait? The Baby Boomers' Guide to Preparing Emotionally, Financially and Legally for a Parent's Death, very useful: Preparing Emotionally, Financially and Legally for the Death of a Parent. 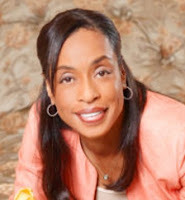 Author Carolyn A. Brent, M.B.A. is a former clinical educational manager in the pharmaceutical industry. As a result of a legal issue regarding her elderly father's care, Carolyn became an avid activist and advocate working with the U.S. Congress for the purpose of creating change to protect seniors and veterans from financial and medical abuse. Because I believe in the importance of having a plan and discussing this topic with family members, I've decided to participate in Carolyn's book launch. Please listen to the interview I conducted with her to learn why it is so important to make end-of-life decisions before you find yourself having to do so in the midst of emotional turmoil. Get your FREE 3-DAY PASS to Carolyn’s Why Wait? Telesummit! The book is having its official Amazon launch on Tuesday November 15th. To celebrate this launch, Carolyn will be hosting a free 3-part telesummit, with a panel of experts in the field of aging and care giving on November 8th, 9th and 10th. This telesummit is a completely free and "no purchase necessary" gift from Carolyn. Be sure to sign up for the free content-rich telesummit at http://babyboomersguide.org/book-launch/telesummit.html. It starts tomorrow and is sure to be informative as you will note in my interview with her. Carolyn has done so much research and has tons of information to offer. The panelists are top notch too! Dr. Caron Goode, with whom I have partnered on several telesummits. She brings a lot of wisdom to the table. Plus, there will be an attorney, a mental healthcare provider, hospice nurse, space planner (teaching home modification to accommodate less mobile residents), and a political candidate on the docket. An incredible panel of experts! Yesterday, Carolyn visited Joyce Joneschiet at http://aginginplaceoptions.com/2011/11/how-to-protect-your-parents-and-make-caregiving-a-family-affair , where they talked about Carolyn writing the book and couple on smoothing certain emotional conversations. Be sure to follow Carolyn tomorrow when the next stop on her virtual blog tour is Shelagh Jones, who will be interviewing Carolyn on her show. See http://SpiritualMarketing-Blog.com/books-by-spiritus-members/carolyn-a-brent-why-wait/. Join us each week on We Are One in Spirit Podcast for more spiritual information and enlightening discussion. You will find our show on our blog http://weareoneinspirit.blogspot.com. We are approaching a momentous time for the celebration of a new influx of energy on Mother Earth on Nov. 11, 2011. I am sharing with you an invitation from Maria Lazzaro, the Dove of Peace Light Prayer Circle facilitator. I hope you will be able to join one or more of the calls to help anchor the energy of 11:11:11. This is a time when the new energies of the combined emerald green and violet light which will bring great healing to humanities ( and all life) physical and subtle bodies of etheric, mental and emotional bodies as well as Mother Earth's body system. The following are prayer times throughout the day of 11- 11- 11 with the Dove of Peace Light Prayer Circle- a Path to Awakening. 10:am-11:30am EST Prayers, dedications, and celebration of receivng tremendous waves of Light. From 11am 11:11 am please align yourself with the highest intentions of receivng love, peace, abundance and joy for yourself and the Earth. ARCHANGEL METATRON WLL BRING US THROUGH THE PORTAL OF NEW ENERGIES ACCOMPANIED WITH A MESSAGE. 11:50AM (EST) We will gather to begin the Divine Mother's Miracle Rosary at NOON. This is a very powerful energy delivered. Noon time is the highest time to say the rosary- any of the rosaries. Today's will be the most powerful. This will be the 4 cycles of the Miracle Rosary. The rosary prayers are written below for your convenience. 9pm-11:11 pm Prayer circle with violet flame affirmations, chants dedications and prayers. THE ANGELS HAVE ASKED TO PLEASE DO AT LEAST ONE RANDOM ACT OF KINDNESS THIS DAY. If you are unable to be on the calls, please intention- give thanks to the divine for connecting you with all the prayers taking place in the highest good. We assure you, you will be connected. This rosary was released by Mother Mary for the specific purpose of bringing forth the miracle of raising the consciousness of humankind and for resolving personal issues. For a detailed explanation, see the following message by Mother Mary. NOTE: By instructions from Mother Mary, this miracle rosary in NOT copyrighted. You have permission to use and distribute this rosary as you see fit. However, please do not alter the rosary. NOTE: To give the complete rosary, repeat the following cycle of affirmations four times (give the Hail Mary nine times for each cycle). This will take 22-30 minutes depending on speed. If you do not have time for the full rosary, repeat the cycle one time. You can insert personal calls and dedicate the rosary for a specific purpose after the initial dedication. We honor your Presence, the I AM, within us. We accept your kingdom manifest on Earth through us. to be all that you are. to the higher will within us. that the universe returns to us what we send out. We take responsibility for our lives and our planet. so that you can deliver us from all imperfect energies. is manifest on Earth, now and forever. Amen. NOTE: The above Hail Mary is the one best suited for the present Aquarian age consciousness. The Hail Mary below is the original one, given as a transition between the Piscean and Aquarian consciousness. You can use either one according to your own sense of what resonates with you. the Lord is with us through you. and by the miracle love of your son, Jesus. we surrender our fears, now and forever. I call to beloved Mary, Mother of Miracles. for myself, for all life and for the Earth. of the manifestation of God’s miracle in my life. Oh God, I surrender myself completely unto you. Oh God, I withhold nothing from you. Oh God, I give my all to you. and I accept that God consumes it now. to win the immortal life of the Christ consciousness. and that my life is built upon the rock of Christ. it is the I AM presence within me who is the true doer. I accept that I am created in the image and likeness of God. I accept that I am a son/daughter of God. and I accept that I AM the second coming of Christ in me. the works through me that he did through Jesus. I accept and affirm that with God all things are possible. in all aspects of my life and consciousness. those who deny the Christ within themselves and others. who are willing to enter the true path. and that their citadels of power, in church and state are no more. I accept that they have no power on Mother Earth. and the true Christ Mass. I accept the miracle of God’s kingdom manifest on Earth. to reign as the spiritual king of Earth, now and forever. for the Earth and all life thereon. the Son, the Holy Spirit and the Miracle Mother, Amen. In the name of the Father, the Son, the Holy Spirit and the Miracle Mother, I seal the Earth in the infinite love and light of the Divine Mother. It is done, it is finished, it is sealed in matter, for the mouth of the Divine Mother has spoken it. Amen. Today I have the great pleasure of being the host on Day 3 of the Virtual Blog Tour of author Carolyn A. Brent whose book Why Wait? The Baby Boomers' Guide to Preparing Emotionally, Financially and Legally for a Parent’s Death launches on Amazon on Tuesday November 15, 2011. Yesterday, Carolyn visited Lynn Serafinn at http://lynnserafinn.com/news-lynn-serafinn-coach-author-workshops-radio-community-leader/what-no-one-wants-to-talk-about-but-absolutely-must , where Lynn shared with you a summary and live interview recording with Carolyn. Today, I'd like to share with you a recent interview I had with Carolyn when I got to ask her some important family questions around support and being prepared. I hope you enjoy it. Yvonne Perry: I know that end-of-life issues are very important, but this is one of those topics most people don’t like to discuss. What do you think are some of the crucial emotional conversations parents, and siblings? Carolyn A. Brent: Thank you for this wonderful question. You are correct people do not want to have these types of conversations. However, if a family avoids talking about the emotional things such as money, hospitals, the "what if" and wait until there is a sudden unexpected emergency, all hell can breakout due to emotions running high. So, it is best to be prepared for your parent’s end-of-life physical, mental, and emotional challenges and ultimate death, by having the conversation early rather than later. Yvonne Perry: My mom is a caregiver for her 95-year-old mother. I would like to see my mom taking better care of her own self and asking for help when she needs it. Do you have any tips about how to get some help when other family members can’t/won’t step in to relieve the full-time caregiver? Carolyn A. Brent: Reach Out for Support! It is critical that you reach out for support for your mom. You can support your mom by asking extended family members and friends to contribute in any way to take some of the pressure off your mother. If your family members can’t/won’t step in to relieve your mom, REACH OUT and get RESPITE CARE for your grandmother. Respite Care will allow your mom to get a week or so off from her 24 hours a day 7 days a week from the work of a caregiver. You want to help your mom avoid caregiver burnout…. Also, take your mom to a day spa, you can offer your mom a day off, a week off, but simply do your best to assist in any way you can to let your mom know that she is not alone. Yvonne Perry: At what point should a family decide to choose hospice care for an ailing loved one? Carolyn A. Brent: Hospice care is appropriate when a person will no longer benefit from curative treatment and life expectancy is approximately six months if the disease runs its normal course. The decision for someone to enter a hospice program will be a joint decision between the person, his or her family members, and his or her primary care physician and the hospice medical director. Life After Death, Beyond a Reasonable Doubt? It’s understandable and natural to wonder or be fascinated by the idea of life after death, but there are so many conflicting accounts! How then are we to assess the truth for ourselves? Well today I’m excited to share an opportunity with you to deliberate the matter for yourself in a very special online trial, and best of all, participation is totally free! We've all heard stories about near death experiences and afterlife encounters, but is there enough evidence to hold true in the criteria used by our court system - beyond a reasonable doubt - that personal consciousness survives death? This is exactly what my friend and colleague New York Times bestselling author and former criminalist, Eldon Taylor investigates in his provocative new series where you, the listening audience, become the jury. But be advised, in your search for the truth, you may well find some of your favorite theories disproved! The evidence in this case will be closely examined via the means of near death experiences, reincarnation, electronic voice phenomenon, animals and the afterlife, mediumship, and more! You will hear in-depth testimony from 14 leading experts in these fields, such as: Dr. Raymond Moody, PMH Atwater—a long-time acquaintance of mine who not only is exacting in her research but also had three of her own near-death experiences that led her into decades of further exploration, Dr. Julie Beischel, Dr. T. Lee Baumann, David Kessler, Dr. Kevin Nelson and Michael Tymn. By interviewing the experts, Eldon evaluates and lets you decide the verdict. The information from this series may surprise you, so be sure to assess all the facts for yourself and make your own verdict. Also, gain access to incredible bonus gifts from numerous sponsors of this program, including one from myself. Remember, there is zero cost involved and this series is only available for a limited period of time. I know this program will offer you many eye-opening moments, so please do check it out - click the link below to join the investigation.